Yesterday was not lovely. For about the tenth day in a row, the sky was grey and the clouds were making their way across the sky. What made yesterday less lovely than the days before was the rain and how it fell. It wasn’t a downpour; it was spitting, that thing older people say some days, and it felt just like that, like Berlin’s skies were spitting in our faces. M and I walked through the gloom to get lunch at a favored Turkish place, and the misery of the day somehow followed us inside. When we got up to leave two older women in headscarves sat down in our places before we could even take our coats off the backs of our chairs. Seemed like they were spitting at us too. 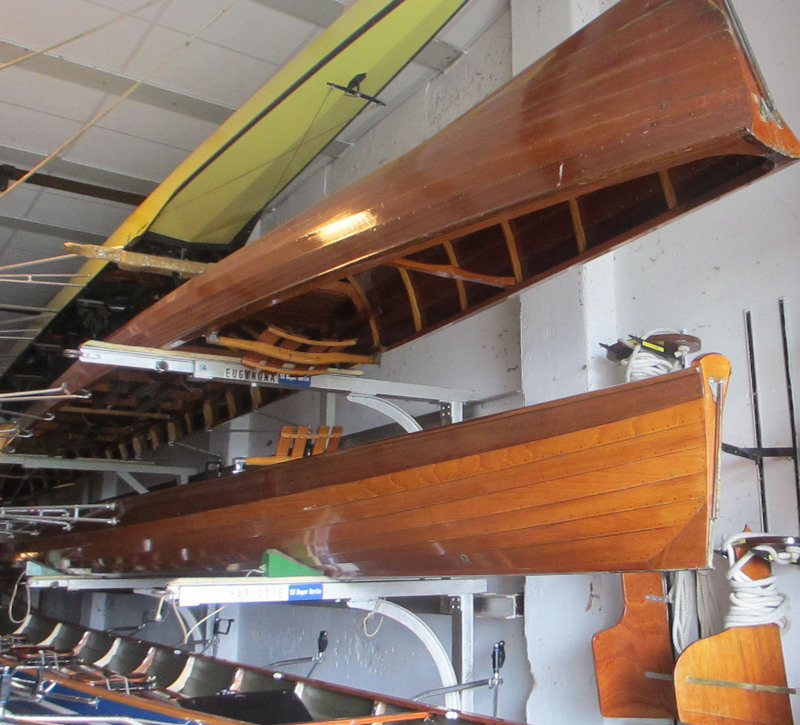 I’d emailed with a woman who was arranging an 8+ for that afternoon, and though the weather suggested we might not go out on the water, I made the hour-long trek to the boathouse just in case. Once you sign up it’s poor taste to blow off the commitment. I got there and was greeted by my bow from the other day, the one who’d given me the history lesson, and she said with a smile, “Schön, eh? Scheiss Wetter!“ and I smiled to both understand her and have a concise, local way to describe the day. Though she’d tried to gather an 8+, we were seven and dropping like flies. One woman came, but only to explain that she didn’t feel well and wasn’t going to stay. Others simply never appeared. An uneven group of us, three men, two women, stood in the grey drizzle and looked warily out at the lake. The thought of leaving my sneakers on the open dock in the rain made me a little miserable. They discussed whatever they were discussing, and then asked me, “Do you want to row?” and I replied, “I’m willing,” and they laughed, their English good enough to understand the difference. Since five people were assembled, a five-person boat it would be, still a wild concept to me, both that such a boat could exist and that a club would purchase such a thing. We manhandled the heavy Fünfer to the water, feeding it into the lake like a canoe. They assigned me to stroke, and for the first time that day my heart lifted. With no coxswain in front of me, I would be able to look out over the stern of the boat, across the water, to the landscape around me. The best view in the boat. And besides, I love to stroke. We shoved off the dock, sat down, and backed our way out of the lane of sailboats, and I was grateful that someone had decided we should take five sets of cleavers instead of the old-fashioned macons. The man behind me told me to row it at an 18-20 stroke rating, a low rating that seemed to suit the day. We rowed for a couple of minutes, then stopped for someone to make a foot-stretcher adjustment. The man behind me said, “Slowly with the slide. I’m 66. I’m an old man. I like it slow.” Turning to look at him, I waved off his concern about age. “Slow is a beautiful thing,” I said, and he smiled at that. Off we went, out onto the Grosse Wannsee, the big lake this time, not the narrow channels I’ve come to prefer. But the rain had kept the riffraff off the water, and only a few working boats were out, and a smattering of sailboats chasing one another around a corner of the lake. A passenger boat went by, and the water pitched and heaved and I was grateful for both the heavy wooden gig boat and the Dramamine in my system. When we paused at the turnaround point, my bow called out to me that off to our left was the Glienecke Bridge she told me about the other day. Even in the fading light I could see how one side was a darker shade of green than the other, a reminder of the border the bridge represented, a rare point where two superpowers faced off and sometimes exchanged spies. Up ahead of us, on the shore, he pointed out, “That’s Cecilienhof, where the Allies decided our fate after the war, and left old Germany out of it,” he said with an apologetic smile. Soon there was a conversation launched in German behind me and all four of them were animated in their discussion, talking about the area’s history, how it unfolded, what it meant. I caught little words like polizei and brücke, but the rest fell around me like the soft rain into the lake, and I looked out over the stern and the now-calm water and thought, this is the best immersion experience I could ever ask for. We rowed back, me trying to keep my roller-sitz under control (isn’t that a great term for “slide”? ), embracing my role in five-seat as Schlag-Frau and trying to set a pace worth following. In the dimming sky, we could see little lights twinkling on in the houses along the shore, and the scent of a campfire wafted across the water. All was silent in the boat other than our oars moving through the water and the clunk of the oarlocks. Back on shore our bow said, “The day’s rain makes for smooth water,” a sentiment repeated by another rower I met up at the S-bahn station on my way home, clearly an adage here, something rowers say to one another. Perhaps because it’s true. And I have to admit, Scheiss Wetter makes for great rowing. This entry was posted in History and culture, Rowing and tagged Berlin, gig boats, Rowing, Wannsee, weather on September 25, 2013 by Jill M..
Beautiful. I love the way rowing has also given you an entry to history, to people’s lived experience of it.